I'm thinking of making a tradition of going to Greece at the end of January. I know it's nearly April now, so this was a while back now, but it has always been a rewarding experience. Athens especially so. I actually wrote an abridged, "commercial" version of this post for Hostelworld, but if you'd like a more detailed and personal take on my trip, keep reading! It is rare that I feel truly recharged on a holiday; usually, the stimulation of being in a new place and the stress of thinking about where to go and what to do leaves me feeling anything but relaxed. With Athens, it was much different. Sure, Greece is quite a different culture to Germany, but I never felt on edge. I also have so much to write about. Soon after arriving in Athens, I decided I wanted to have it all for myself. It's true that I had wanted to go there ever since I was a kid, thanks to the mythology (even if my impression of it was a bit Disneyfied), and then I did Classical Civilisation as one of my A-Levels and was always a bit disappointed that I never got to go see all the Greek sites for myself. But in the run-up to my trip, I had been a tiny bit apprehensive that I was going to get my very own version of Paris syndrome. However, I managed to keep my expectations realistic and looked forward to being surprised; I had been to Thessaloniki the previous year, so I already had an idea of what modern Greece was all about. Still, I felt sort of sad, preemptively, for all the stuff I knew I wasn't going to be able to fit into my short trip. I stayed centrally, near Omonia metro station. It wasn't that pleasant to walk through at night, and I experienced quite a bit of street harassment. Still, I didn't spend that much time at my hostel. Soon after arriving in Athens, I wandered some of the back streets until I reached Monastiraki Square, which is probably the main tourist meeting point, and it sort of reminded me of Covent Garden in London. I was already pleased to experience sunny weather, even though it was windy enough for me to tuck my scarf in and even put my gloves on. Just a short walk up some steps from the bustling square, I saw the Roman Agora, Hadrian's Library, and quiet streets with quintessential Greek houses (an area that I later found out is called Anafiotika). It wouldn't be Greece without some cute strays (look, don't touch). Athens also has a lot of orange trees and a lot of pigeons. I love the marble streets everywhere. It sounds like a no-brainer, but I was already getting the impression that the most comparable city I'd visited was Rome... which was nearly 10 years ago! And that's independently of the classical aspect. Why are the residential buildings similar, looking white and off-white from above, just like in Paris — but this isn't the case in cities in Germany and Poland, which are on the same latitude? 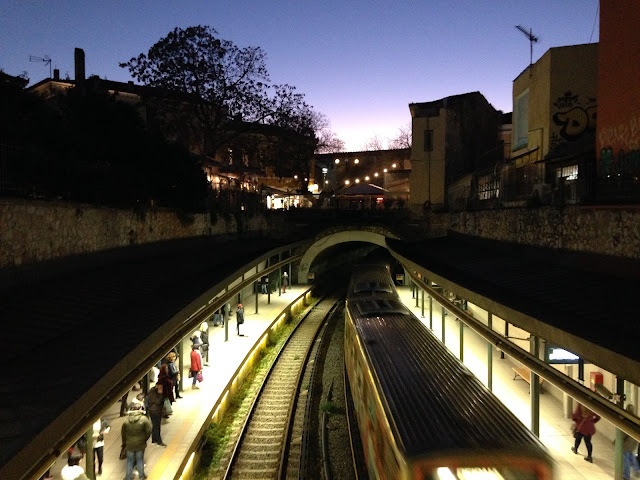 Before long, I felt sure that Athens had the cleanest metro I had ever seen, even if its streets were dirty. I saw workers mopping it at all hours of the day. I didn't see any rubbish on the floor. Everything adhered to a colour scheme of beige and silver. Almost every station sign in the city centre was faithfully rendered in glass. No graffiti in sight. No smell of cigarette smoke. 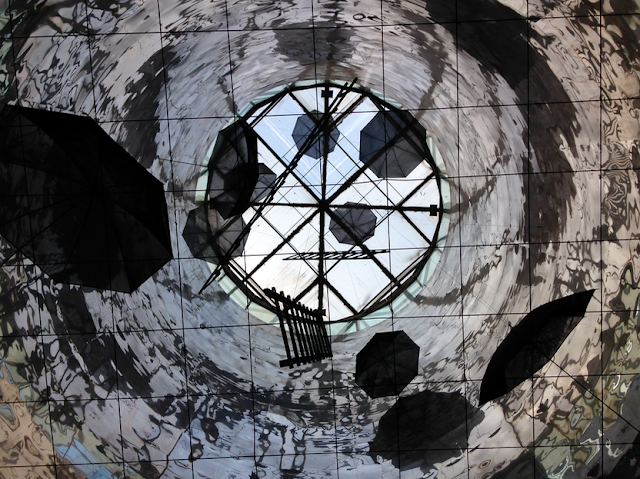 The Athens metro was a subterranean world unto itself. Women held their scarves over their mouths for fear of germs, men played with komboloi for fear of superstitions coming true. The distances between stops were long; as we whizzed through the darkness, I knew acutely that we were on the same level of ground that the ancients would have walked on before the thousands of years of sediment. I knew that in excavating the stations, archaeological treasures had been unearthed. It was quite extraordinary. I wasn't just travelling around a city via its tunnels — this nondescript earth on the other side of the glass and metal was a crucial part of culture, some of it claimed by the British and the Germans. 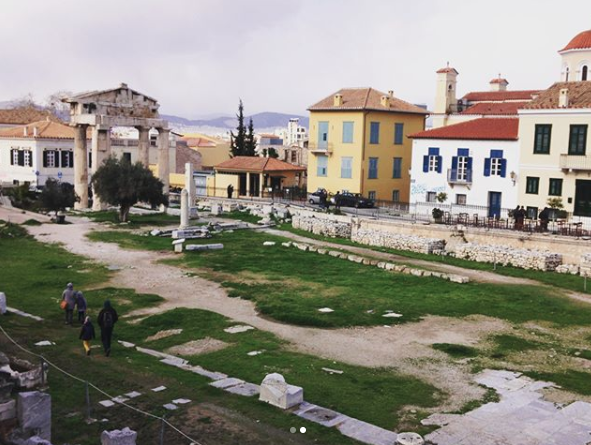 On my first day waking up in Athens, I decided to explore the neighbourhood of Pangrati. I grabbed a coffee at a jazzy café-bar called Magic Bus (by the way, what struck me in Athens was that everything seemed to be a café by day, bar by night — probably to make the most of rental costs). I felt a vague sense of familiarity as I wandered this area: the supermarket I popped into and managed an entire interaction in Greek with the cashier (using three words!) reminded me, somehow, of the Sainsbury's I went to in second year of uni. There was this weird vibe in the air that made me feel like I'd been on this street before, specifically in Gdansk. Hellenic Parliament, with the Monument to the Unknown Soldier right in front. The guards wear traditional Ottoman-era clothing. This tiny Orthodox chapel is nestled right under a big, modern hotel. Athens is full of examples of new stuff having to carve a space around the old stuff, rather than old stuff giving way to new stuff. My big plan of the day was to go up the Acropolis, the famous hill in the middle of Athens with lots of ancient remains. It was a beautiful sunny day. The area around the actual Acropolis metro station was pretty quiet. I got the €10 ticket which allows you to explore the south side of the hill and the peak. On the way up, there were a lot of temples and theatres that served as a warm-up for the Parthenon — they were great in their own right, of course, but what I really enjoyed was the sense of anticipation as I neared a monument I'd wanted to see for years and years and years. It was here that I most appreciated having chosen to visit Athens in January. There were people up there, sure, but I imagine it was fraction of the summer visitors. It was a little windy, but the sun was out. Most importantly, the fact it wasn't hot meant there was no smog obscuring the view. I found the whole Acropolis experience rather hard to process, though it's probably one of the few experiences in my life where I can say I was truly in the moment. In the late afternoon, unlike back in Berlin, the sun was still in the sky and I had a sense that the day still wasn't over. I wandered back down the hill, and felt content in a way I had not for a while. The next day, a little excursion was on the agenda — I was determined to see the sea, so I went to Piraeus, a port city separate from Athens, but luckily still part of its metro network. Most of the green line stations on the way there were above ground, so I glimpsed parts of the city I was ignorant of. After having a coffee that was eye-wateringly expensive for no apparent reason, I wandered around trying to find a place where I could gaze upon the water. From the main streets of Piraeus, it took about half an hour to walk around to a more secluded area. I wasn't actually expecting to find a beach per se, but there it was. Definitely didn't imagine, like, Odysseus sailing in. To get back into town, I had to climb up a ridiculous hill, then walk down it again. I got off at Kerameikos station and wandered up towards the Technopolis, which is a sort of low-key museum complex detailing Athens' industrial history. I couldn't really identify any part of it that I was very interested in paying to see and I preferred to spend my time outside, so I walked on. I wandered a bit more along Pireos, as well as navigating my way down some tiny, quiet, residential streets to get to Beaver, where I had a drink and enjoyed the last of the afternoon light at a women's co-op called Beaver. Athens is so bustling that I was quite astonished at how it felt like it was in the middle of nowhere. On the way back to the nearest metro, which took a good 15 minutes, I walked parallel to a suburban train. In the evening, I definitely wanted to check out the nightlife. I'd heard of a bookshop/bar called Poems & Crime, so I stopped in for a drink. There was already a crowd of older people sitting at tables there. The waiter said that there was about to be a talk in Greek about a new book about the Holocaust, but I could still stay if I wanted. So I sat there, writing, sipping my red wine, understanding nothing, but it was perfect. I still hadn't managed to make it to any actual museums in Athens, so the next day, I went to the National Archaeological Museum in the Exarchia district. It was still very good weather and I felt a bit weird about "wasting" the last of the day's sunshine indoors — which is pretty much my default mindset in Berlin, particularly in the winter. But then I remembered, duh, I'm in Greece, no need to worry. There was so much in the museum and I didn't see anything close to all of it, but I really enjoyed the "Odyssey" exhibition, which was about journeys of all kinds and, of course, Odysseus. Unsurprisingly, he is an important figure in the Greek psyche, as he stands for nostos: persisting through life's challenges and ending up at home, whatever that means to you. There was also a poem called 'Ithaca' playing on a loop, narrated by Sean Connery, which was quite funny. My last day in Athens was drawing to an end. I wandered through the Kolonaki neighbourhood, which is a stark contrast to the rest of the city; I saw artisanal cheese shops, designer boutiques, and nice cars. It was my aim to get to the top of Mount Lycabettus, the highest (and pointiest) hill in the city, for sunset. I struggled with the steps, but I made it to the funicular station. It was a little bizarre, being the only lone visitor in the lift, as most people were with their significant others. And once at the top, the view was indeed very romantic. I'd made it just for the right moment, and I gave myself a figurative pat on the back. The view was just breathtaking, and all I had to do was turn 180° to see day and then night. I rounded off the evening at a bar. It was not the one I had been specifically looking for, but it was in the same building? Weird. I took a lift up to the roof and thought, this is good enough. I had a glass of wine and free delicious crisps with a view of the illuminated Parthenon. Perfect. The next morning, I got up at a not-too-unreasonable time to head to the airport. I felt sad to be leaving, but grateful to be able to add yet another entry to my list of places in the world where I can feel so content. Alright, I know you're all waiting for it: how does Athens fare as a vegan city? Not too bad, really. If you are keen on cooking in your AirBnB or whatever, there is plenty of fresh, affordable, local produce available. There are also quite a few bio stores dotted around, many of which carry exactly the same brands of tofu, etc. as in Germany. In particular, I really liked a vegan shop/café called Bamboo. The people working there were cheerful and engaging, and it was just a nice little place to decompress and enjoy a drink. Unfortunately, I didn't find any local products that I could take home on the plane, though. I can recommend two excellent lunch spots, both conveniently located near Monastiraki. I will openly admit I ended up visiting Falafel House no fewer than three times. Its offerings are about 50% vegetarian, 50% vegan, and really good value. The hummus in particular was lovely. Vegan Nation is tucked away off the square, and its aesthetic and concept are very similar to the rebranded Aux Vivres in Montreal. They have chilled salads, wraps, cheesecakes, stuff like that... even a vegan version of Ferrero Rocher. I was a little bit concerned about all the packaging (even if you eat in, you still have to throw away a plastic tub), but it was still good. Definitely not a place to have a hearty dinner, but it's open until 10pm so you can grab something if you're peckish. But I did have dinner at two restaurants! On my first night, I had a moussaka at the 100% vegan Mama Tierra, which was the absolute best comfort food after a day of travelling, and the people working there were as welcoming as Greeks are famed to be. I ended up returning there another evening, and didn't have as great an experience with the service or the food. I got the impression I was annoying the (different) waitress, and my linguine was pretty lacking in flavour. Still, I see lots of good reviews online, and wish I'd tried the mushroom burger that time instead. Then there was Avocado, on a cute side street near Syntagma Square. I really enjoyed my experience there! The service was so attentive as to be almost American (in a positive way)! I was placed upstairs on a low table, sitting on cushions, and I really liked it. I was able to just fully chill out and enjoy my food at my own pace. I ordered black noodles with various roasted veggies and almonds in a peanut sauce. It was really satisfying. Overall, I actually paid more for the meal than I would for something similar in Berlin, but I am happy to support vegetarian businesses in a place where the scene is still emerging. All in all, I fell in love with Athens, and maybe even deeper in love with Greece in general. I definitely hope to be able to come back to Athens sooner rather than later, but my next step will have to be an island! How can you ever hope to understand Greece, with its huge diaspora, singular language, and pervasive history? It's a question I hope to be able to answer over the course of my life.